The 2015 Buick LaCrosse is the brand's flagship sedan, offering a wide variety of features and options designed to attract younger, newly affluent buyers. It offers conservatively handsome styling, plentiful standard equipment, comfortable road manners, and impressive powertrain technology for the money, especially the eAssist mild hybrid. If you're looking for a premium large near-luxury sedan, but don't want to go the me-too route of a Lexus ES, the 2015 Buick LaCrosse offers up a compelling alternative, all while satisfying your inner "buy American" voice. Buick is definitely an ascendant brand, but for many up-and-coming car shoppers, it's not quite there yet. Competitors like the Lexus ES or Acura TLX might be more satisfying to the badge-conscious sedan buyer. The 2015 Buick LaCrosse gets some noteworthy technology improvements. GM's OnStar now uses 4G LTE technology, and the LaCrosse gets a standard Wi-Fi hotspot to share the Internet connection. The LaCrosse also benefits from the new Siri Eyes Free, a comprehensive integration of the speech recognition technology from Apple's iPhone. Last year, the Buick LaCrosse was on the receiving end of a host of updates improving the appearance and function of the interior. Thankfully, nothing has changed here, and the 2015 Buick LaCrosse remains a comfortable, cathedral-quiet and roomy sedan for driver and passengers. The multi-adjustable front seats are comfortable for short hops or long hauls, and are covered in leather in all trims but the most basic. The rear seat offers plentiful headroom and legroom, and if you fill the massive trunk, you've overpacked. The the 4-cylinder model's eAssist battery pack compromises cargo space, but not too badly. The Buick LaCrosse also got an exterior refresh last year, with the focus on giving it more road presence. We'd say, mission accomplished. The sculpted hood, larger grille, and redesigned headlights give this big sedan a purposeful and expensive look. The same goes for the rear end, which also got refreshed last year. Other highlights include active shutters on the lower grille, to help aid aerodynamics at speed. There are also optional articulating bi-xenon HID lights, designed to help you see around corners on dark roads. The 2015 Buick LaCrosse eAssist light-hybrid boosts fuel economy and performance, but never operates in a fully electric capacity like a Lexus ES 300 hybrid. However, eAssist's benefits are real, and the system is virtually transparent in its operation. The 15-hp electric motor helps the 182-hp 4-cylinder gasoline engine during acceleration, and when slowing, the motor becomes a generator to recharge the lithium-ion battery pack. The gasoline engine also shuts down at stop signs, but restarts are devoid of the shudder found in many stop-start systems in non-hybrid cars. Whether you choose the eAssist or V6, the LaCrosse boasts competent handling, a smooth ride and strong brakes. It's no sports sedan - the steering is particularly numb, for example - but for long distance cruising, the quiet cabin, excellent audio and comfortable highway ride are ideal. In town, hill-assist prevents rollback on uphill launches, handy in places like San Francisco. 2015 Buick LaCrosse prices start a little over $34,500 for the base sedan, including destination. That translates to a very strong initial value statement and long-term fuel-economy advantage for the eAssist-enhanced 4-cylinder LaCrosse against its competitors. The Leather, Premium 1 and Premium 2 groups pile on about $2,000 as you go up each level, with a Premium 2 with the V6 coming in around $40,700 or so. All-wheel drive on the Leather and Premium 1 models adds about $2,000 as well. Be sure to check the Kelley Blue Book Fair Purchase Price to find out what buyers in your area are paying for their Buick LaCrosse sedans. Generally speaking, Buicks don't hold their value quite as well as other premium and luxury brands. In addition to the aforementioned 4G LTE and Wi-Fi, all 2015 Buick LaCrosse models get a standard rearview-camera system. That adds to an already lengthy list of standard features, including a full-color driver information center, OnStar (with a 6-month subscription), SiriusXM Radio (3-month trial), a manual tilt/telescoping steering wheel, remote keyless entry, dual-zone automatic climate control, 17-inch aluminum-alloy wheels, and both Bluetooth and USB connectivity. Standard safety features include traction and stability control, brake assist and six airbags. There is a caveat to that built-in Wi-Fi business. It's free, but only for the first three months. After that, you'll have to pay for the service as an add-on to GM's OnStar telematics system. Other options for the LaCrosse abound, including bi-xenon high-intensity-discharge adaptive headlights, Side Blind Zone Alert, a (terrific) head-up display, and heated and ventilated perforated leather-covered seats. There's also navigation, a rear-seat DVD entertainment system, a power rear sunshade, and a 10-volt power outlet for charging phones or computers. A new Ultra Luxury package adds premium perforated leather seating in a coffee-hued design tone. You're on a road trip, yet the two kids in the back seat aren't fighting. Why? One's watching a streaming Netflix movie on his iPad, while the other is video-chatting with her friends over FaceTime. Thanks to the 2015 Buick LaCrosse's built-in 4G LTE and Wi-Fi hotspot, it's no fantasy. The head-up display on the 2015 LaCrosse sedan is one of the best we've seen. It displays speed, navigation instructions, audio status (including song titles) and other key information in your line of sight, seemingly out there over the hood, with easily adjusted brightness and vertical position. You can get your 2015 Buick LaCrosse with one of two powerplants. First is the eAssist powertrain, a 4-cylinder engine plus a small electric motor/generator to provide both a power boost and regenerative braking. It's standard on base and Leather models. The 304-hp 3.6-liter Flex-Fuel-capable V6 is available at no extra cost on those models, and it is the only engine available on Premium I and Premium II models. If you get the V6, you can also get all-wheel drive on Leather and Premium I models. All 2015 Buick LaCrosse sedans use GM's latest 6-speed automatic transmissions. The V6 provides more power for passing and acceleration, but the eAssist is more interesting technologically, and gets better fuel economy. Buick wants to appeal to younger buyers, and the 2015 LaCrosse sedan is at the forefront of that effort. It's handsome without being in-your-face about its styling, and it comes very well equipped even in base models. On the road, it's comfortable and quiet, with a pair of refined drivetrains to choose from: a 2.4-liter 4-cylinder with GM's "eAssist" mild-hybrid system, or a 304-horsepower V6. Conservatively handsome, well equipped, capable, quiet, comfortable, and refined, the LaCrosse presents well as a thoroughly credible alternative to import brands like the new Hyundai Genesis and Acura TLX sedans. You can even add the traction enhancements of all-wheel drive. This year, the Buick LaCrosse expands its technology portfolio as well, with 4G LTE and a wireless hotspot. 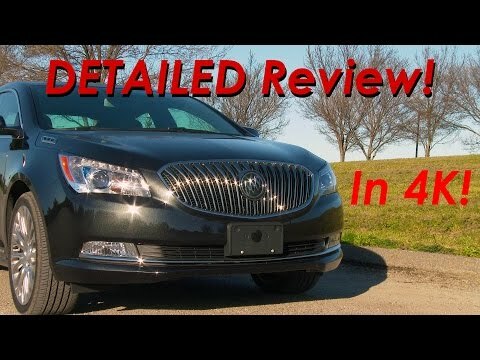 2015 Buick LaCrosse DETAILED Review and Road Test - in 4k! It registers 170 miles per hr so punch it squeal tires and ready to go. I love my Buick lacrosse! It took me a couple of weeks to get use to the backup camera and getting comfortable with the different features. That being said, I love all the safety features: it lets you know when you are getting too close to a car in front of you it lets you know when you are changing lanes and you might be going to hit another car, I love the infotainment center with the Bluetooth phone calling texting it has so many features on the dashboard everything is digital, I love having access to my trunk through the back seat I love the keyless entry I love the fact that I can crank that car start the engine from inside my house and when I get in the car it is cool for me and my special favorite radio station is already on so far I haven't found anything about it that I do not like best car I have ever owned! I love the sporty look of it and the unusual shade of blue this is my third Buick the first two were Buick lesabres I love those but they were nowhere near as classy as the Buick lacrosse! Naps are good to take in this car. No problem s with the 2015 lacrosse Buick. It rides very smooth. It gets good gas mileage. There are leather seats that are of excellent quality. The dashboard has not cracked and is of great quality. . . The seats are dual cooled and heated. . . They are comfortable seats that are comfortable for long trips. The heated steering wheel keeps hands warm. The panoramic roof is leak free. The back seats are comfortable and roomy with a comfortable armrest and air vents to stay cool. . . Backseat pockets are handy for trash or to store things. The trunk is large and roomy. Great sedan for the whole family. Excellent performance and acceleration for a v6. Smooth ride, but decent handling. Extremely spacious cabin. Backseat room is best of any car I have ever owned including the big land yachts from the next 1970s no major issues in 3 years of ownership. Minor issues have been some hesitation in acceleration at 45 mph and it is a bit difficult to park due to its long wheelbase.